Yesterday morning was lovely, cool breezes and sunshine. I got out and did some necessary bunny chores; should have done more but just didn't feel up to that much. But I got the floors swept up and the worst trays shoveled out so everyone is comfortable. Then my young friend Kym stopped by with car problems; I think the muffler or something is rusted out. The tame Buick is making noise like a race car. She went on to work but had more trouble with it last night. Poor girl! Since the sun was shining I headed up to the craft tent and we set up for the day. A talented lady that I know a little stopped by to investigate and showed us a beautiful woven shawl she had made of some wonderfully colored bulky handspun yarn. It was fun to visit with her and her little dog, the most self-possessed and courtly little Pomeranian I've ever known. We had a quiet day yesterday; not many people discovered us but it was nice to talk to the few that did come down. 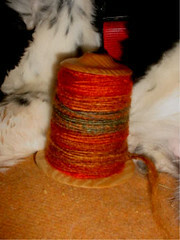 I spun up a bobbin of painted mohair from Tintagel Farm that I bought at Maryland Sheep and Wool a couple of years ago. I bought it because I liked the colors, orange and green, mostly, with some subtle variations into red and melon. I also liked the name of the farm, especially since I had just returned from Cornwall at the time! I also plied some singles that I spun up some time ago. This was a blend of my angora with some silk noil that I purchased on Ebay even longer ago. 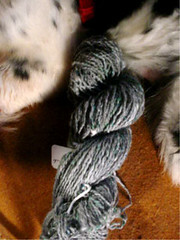 I really like the finished yarn, which has a frosted look of black angora and bits of green and blue silk highlights. Once you get the bug bits out it's a lovely yarn! A storm came in during the afternoon; we almost ran for the cars but the storm didn't seem too bad. So we sat comfortably under the tent, listening to the thunder and working on our projects. Sue was weaving an embellishment for a gourd rattle; it turned out beautiful with black yarn and cat's eye style blue beads against the wood-toned gourd. 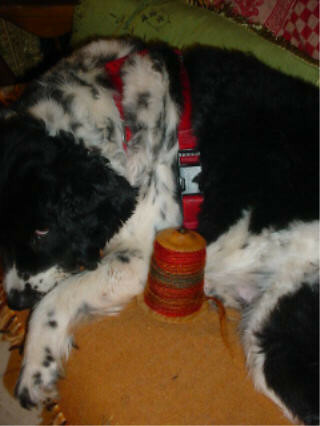 I was plying my silk and angora, getting happier with every turn of the wheel with the resulting yarn. It was a little fussy to work with because I had overspun the original singles but I have a nice balanced two-ply now that I will probably use in a crocheted Jacob and angora shawl. After we packed up the craft show I came home and washed dishes (twice in one week, a record!). A few minutes later Brandy and her mother came to pick up her rabbits and talk bunnies. We had a wonderful time chosing the rabbits she wanted to compliment the lovely does she bought at Avillion Farm. A black buck from ISeeSpots Elwood Blues and Living Water Farms Angel's fine litter was an easy choice; I think he's even nicer than the blue doe I'm keeping. And Woolybuns Yankee Doodle Dandy has a new home with a lovely, caring young lady. I warned her about his coat not being as easy to tend as I like but she was bowled over by his sweet nature and good body type. I think she made an excellent choice! This young lady has a good eye for a buck; she also took along Woolybuns Raphael. All these rabbits are going to Colorado next month to found a colony of German Angoras there. As far as I know, there are no other German Angoras in Colorado, so Brandy's bunnies should do well there. We had a mini-shearing session with the little black buck so that he would be comfortable for the trip. He was a darling, which made me look good! Then, because my tattoo pen STILL hasn't arrived, I had to tattoo him with the old clamp thing. He squealed but we comforted him and he soon forgot with a little carrot and attention. We got a good tattoo; just as I'm learning how to get it right with the clamp I'm switching. But I feel much better about the pen; it's a lot less traumatic, I think! Everyone seemed happy when they left; girls and bunnies all. 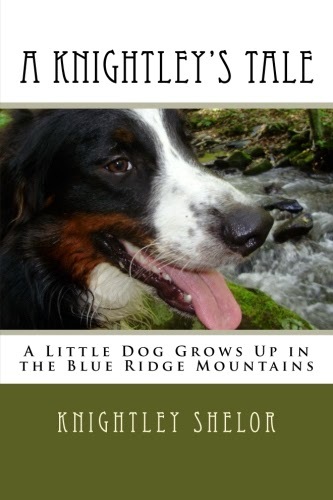 I'll look forward to hearing about life with Germans in Colorado from Brandy! It's raining this morning so I don't know if we'll try to craft tent or not. Time to tackle the morning bunny chores, which don't wait on the weather. Lily hasn't stirred from her bed this morning; she hates rain! I want you to look for my blog.